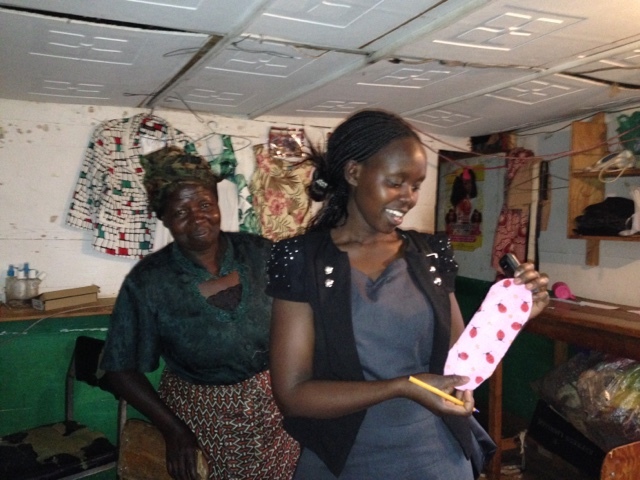 My co-worker Judith and I were moved by the following video about Menstruation. As the video shows many women and girls in Kenya don't have resources to buy female hygiene products. At the same tome they are also being shamed about such a common and natural biological process that happens to all cis-women. Girls in many parts of Kenya and around the world do not have proper sanitary supplies and often miss school due to being on their periods. A study showed that adolescent girls in Kenya lose an average of 3.5 million learning days a month due to their periods. Girls who miss school are more likely to drop out of school. UNESCO estimates that girls make up 70% of all children not in school around the world. It seems silly that your period can hold you back from obtaining an education and it's sad that girls are so ashamed about menstruating. It is also found that girls are often not taught about their periods. It's such a taboo to talk about menstruating in Kenya, which creates a tremendous amount of stigma, confusion and fear about menstruating even among women and girls. 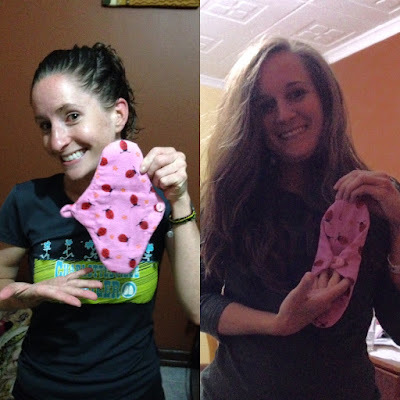 Many organizations such as Lunapads, AFRIpads, Thinx and Days for Girls have supported the distribution of reusable pads to girls around the world. Well it's time for an new company to increase the amount of re-usable pad giving: Pads for A Purpose (aka P4P). Yesterday Judith and I, after work, went to the market to buy fabric and visited our favorite tailor who has promised to help us with our project. Today we made our first prototype, it's not perfect but it's a start. It's costs about $1 to produce one reusable pad including fabric and labor. That's not all...In addition to two reusable pads a small bar of soap to clean them, girls will also get an pamphlet which my friend Amy and I are putting together. This pamphlet will give them some information about menstruating, puberty, how to take care of their body and how to clean the new pads. We hope to distribute them through AMPATH to girls and women in need of female hygiene supplies. In addition, I hope our project brings awareness to the natural an non-shameful process that is menstruation and combat some of the false beliefs about periods. I hope it will decrease the number of girls dropping out of school and lessen the stigma about talking about periods. I am hoping to start a go-fund me project to raise some initiation costs for the materials and possibly in a larger scale a buy-one get-one for a girl in Kenya type non-profit. Also if you have not used reusable pads yet, get ready to be surprised. They are comfortable and decrease the impact women have on the environment. Did you know women use about 10,000 sanitary products in her lifetime, imagine that sitting in a dump. Sit tight for updates. Tomorrow I am going to make a second prototype. 1. What is the absorbency of your pad? How does that compare to the amount of menstrual blood on average each day a woman produces? Or maybe more importantly how does that compare the to the amount of menstrual blood a woman who has heavy periods produce in a day? 2. What is the water source like to clean these? Is there a place for them to clean them in private because there is often strong social stigma related to this act. Women are often banned from using village water sources to clean their menstrual cloths. 3. Is there also a place for drying them that can be private. Moist cloth is a breeding ground for bacteria so there could be other potential health hazards associated with resuable pads if not taken care of properly. If you want to talk to a few people who have been working on this issue let me know. Hope it all works out! Your head is in the right place! Hope you are doing well over there! I hope you are doing well. What have you been up to? I really appreciate your questions, they have been similar questions I have been thinking about too. I could definitely use some help if you know of anyone who has done a similar project. I have been testing the designs by pouring water onto them. The big problems I am running into is not finding PUL (waterproof) fabric in Kenya. I might have to import it from USA which is going to be a big hassle and very expensive and I am trying to make them for $1 a pad. But it has yet to be made for large scale distribution. Any suggestions for drying in private would be welcome. We can definite suggest in our small informational handout. Any suggestions would be great. I have been showing people my designs and many (especially men) have no idea what it is. They study it so intently until I tell them. I am trying to get the healthcare people around me more comfortable with this topic.